To measure the mass of neutrinos, scientists study radioactive decays in which they are emitted. An essential ingredient is the decay energy which corresponds to the mass difference between the mother and daughter nuclei. This decay energy must be known with highest precision. A team of scientists now succeeded to resolve a severe discrepancy of the decay energy for the artificial holmium (Ho) isotope with mass number 163. It decays by electron capture to the stable dysprosium-163 (163Dy) and appears well suited to measure the neutrino mass. The team prepared pure samples of 163Ho and 163Dy and directly measured their mass difference with high accuracy using the Penning-trap mass spectrometer SHIPTRAP. The research results have recently been published in Physical Review Letters. Neutrinos are everywhere. Hundred trillion neutrinos are traversing every human per second, but one of their fundamental properties, i.e., their mass, is still unknown. While the standard model of particle physics predicts neutrinos to be massless, observations prove that neutrinos must have a tiny mass. By studying neutrino masses, scientists thus explore physics beyond this otherwise so successful Standard model. So far, only upper limits of the neutrino mass could be determined, confirming it to be tiny. This makes a direct mass measurement a challenging task, but spectroscopy of radioactive beta decay or electron capture in suitable nuclei is among the most promising approaches. All radiation emitted in the radioactive decay can be precisely measured, with the exception of the fleeting neutrino, which escapes detection. The neutrino mass is thus deduced from comparing the sum of all detectable radiation to that available for the decay. 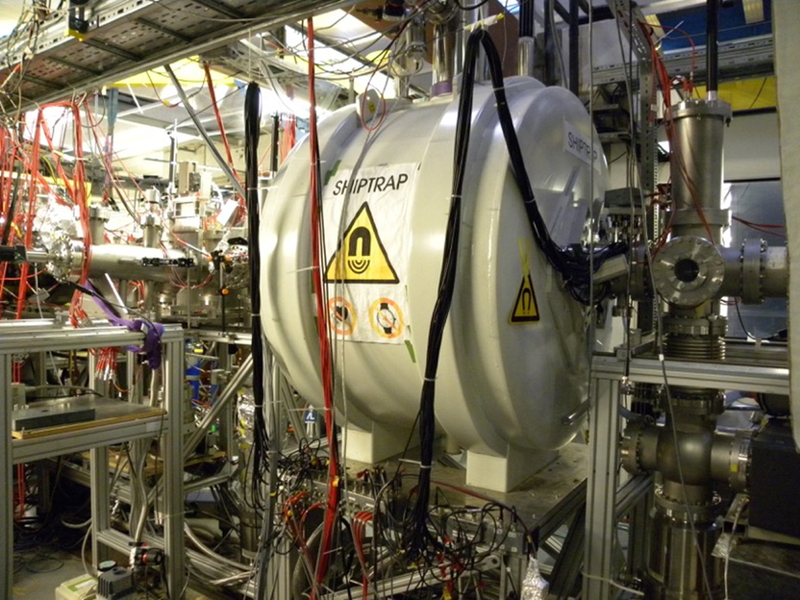 An artificial isotope of holmium, with mass number 163, is in the focus of several large collaborations aiming at extracting the neutrino mass from measurements of the energy emitted in the electron capture decay of 163Ho to the stable 163Dy. Currently in the lead is the ECHo Collaboration, centered at the University of Heidelberg. A prior clarification concerning the various values reported for the 163Ho decay energy is mandatory. 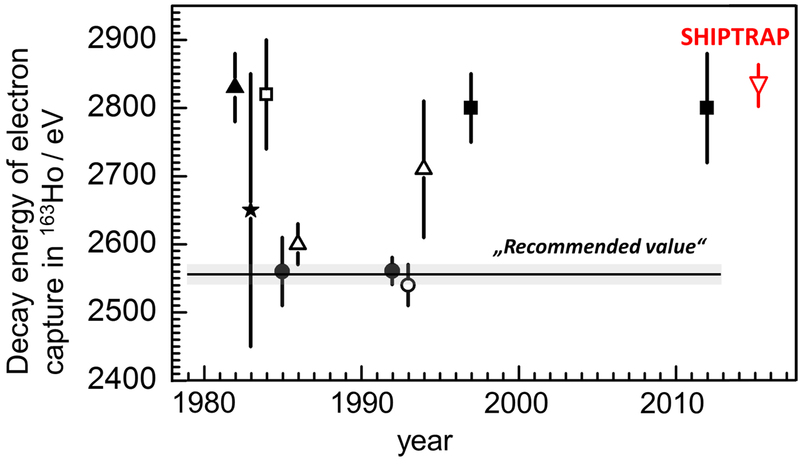 Values that span the quite large range from about 2,400 to 2,900 electron Volt (eV) have been published over the past decades from indirect measurements performed using different methods. The value recommended in data tables is on the lower end of this band, but the more recent results are some 100 eV higher than this recommended value casting doubt on its validity. In this situation, an attempt to measure the neutrino mass from the 163Ho decays is questionable. To solve this puzzle, a team of physicists, chemists, and engineers from Germany, Russia, Switzerland, and France combined their expertise and unique instrumentation: While natural dysprosium contains sufficient amounts of 163Dy, samples of 163Ho, which does not occur in nature, first had to be prepared from natural erbium enriched in 162Er by intense neutron irradiation in the high-flux research reactor at the Institut Laue Langevin inat Grenoble in France. Sample purification and processing was done at the Paul Scherrer Institute Villigen in Switzerland and at Johannes Gutenberg University Mainz. The atomic mass difference of 163Ho and 163Dy was directly measured using the SHIPTRAP Penning-trap mass spectrometer at the GSI Helmholtz Center for Heavy Ion Research in Darmstadt. Based on the equivalence of mass and energy according to Albert Einstein's famous equation E=mc2, the mass difference translates into the energy available for the decay. "To determine the masses of holmium and dysprosium, we measured the frequencies of their ion's circular motion in the strong magnetic field of the ion trap, using the novel phase-imaging ion-cyclotron-resonance technique, which allows measurements with highest precision", explained lead scientist Dr. Sergey Eliseev from the Max Planck Institute for Nuclear Physics in Heidelberg. "This circular motion is projected onto a position-sensitive detector in a way that even small mass differences can be determined much faster and more precisely compared to previous methods." 163Ho and 163Dy were measured alternately in intervals of five minutes for several days. An averaging procedure resulted in a final value of the decay energy of 2,833 eV with an uncertainty of only a few tens of eV. This confirms the recent results, settles the long-standing discrepancy, and thus provides confidence to the approach proposed by the ECHo Collaboration. "For the statistics expected in the first phase of the ECHo experiment called ECHo-1k, funded by the German Research Foundation (DFG) with a Research Unit, we will reach a sensitivity below 10 eV for the neutrino mass, which is more than a factor of ten below the current upper limit", explained ECHo spokesperson Dr. Loredana Gastaldo from Heidelberg University. Within the ECHo Collaboration, a research group headed by Professor Christoph E. Düllmann of the Institute of Nuclear Chemistry together with colleagues at the TRIGA research reactor at Mainz University have been responsible for the production and preparation of the needed supply of 163Ho. 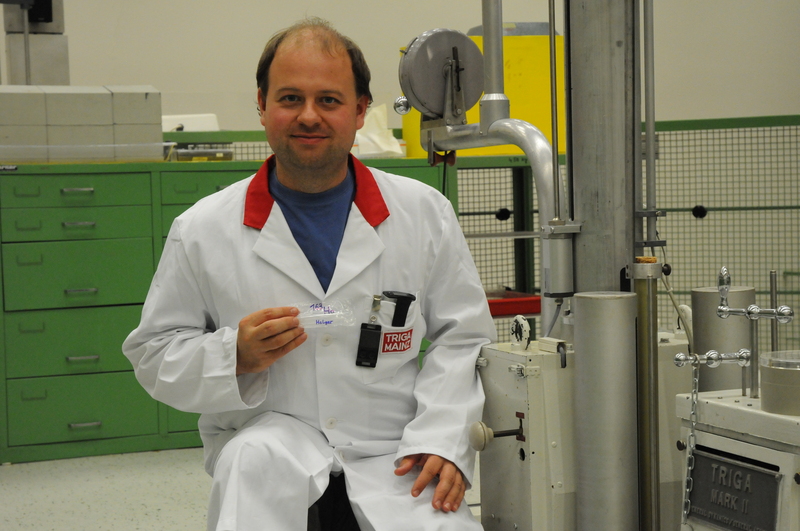 "Our successful production of 163Ho samples for these studies is an important step towards the preparation of samples suitable for a sensitive measurement of the neutrino mass," said Düllmann. "For this, we will introduce yet another level of cleaning of the samples. In cooperation with the group of Professor Klaus Wendt at JGU's Institute of Physics, we will exploit the Mainz-based RISIKO mass separator to receive samples of highest purity, as they are necessary for the envisaged experiments." The new result (red) confirms the recent results for the decay energy of 163Ho. The various symbols stand for different measurement techniques. Holger Dorrer from the JGU Institute of Nuclear Chemistry on the platform of the TRIGA Mainz research reactor that was used to verify the purity of the sample. He holds the produced and separated holmium-163.